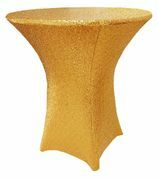 Spandex Table Covers /Stretch Fit Tablecloths Wholesale Free Shipping over $150 - US 48 Contiguous States! Wholesale Spandex Tablecloths, Spandex table covers, Spandex table linens,spandex elastic table covers, lycra table covers, stretch table covers and spandex fitted tablecloths transforms any table into a beautiful eye catching, smooth, wrinkle-free look. 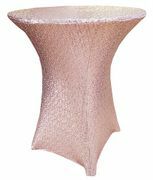 Our Spandex table cloths & spandex fitted table covers available in size 48" round , 60" round , 72" round spandex table covers, also 6 ft rectangular, 8 ft rectangular spandex banquet tablecloths & table Covers. Spandex Tablecloths bring a new added flair to your display's at trade shows, or your corporate event, weddings. With the flexibility of the spandex fabric you never have to worry about wrinkles, Spandex table cloths and Spandex table toppers are perfect use for wedding, events, banquets, hospitality industry and conventions.